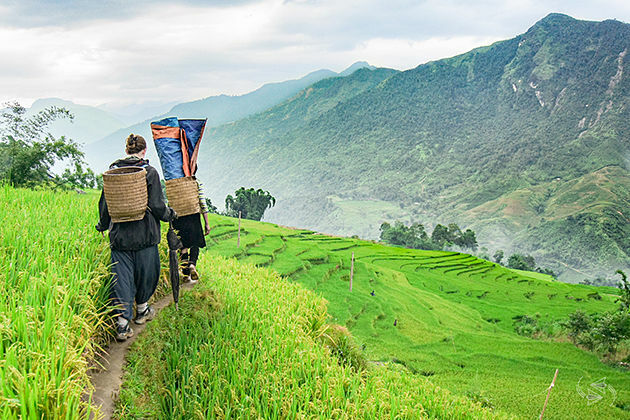 Being famous as the tropical heaven in the North of Vietnam, Sapa is well-known not only for summer resorts but also for impressive trekking routes in Sapa for all travelers. 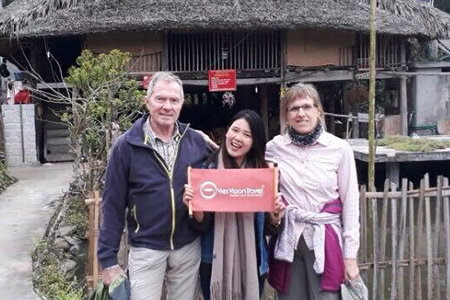 Making use of the natural advantages of spectacular landscapes such as rice terraces, sweeping mountains, wild forests and villages of various ethnic minorities, Sapa is an ideal place for the explorers who love adventures and desire in natural-based activities, especially Sapa trekking tour. 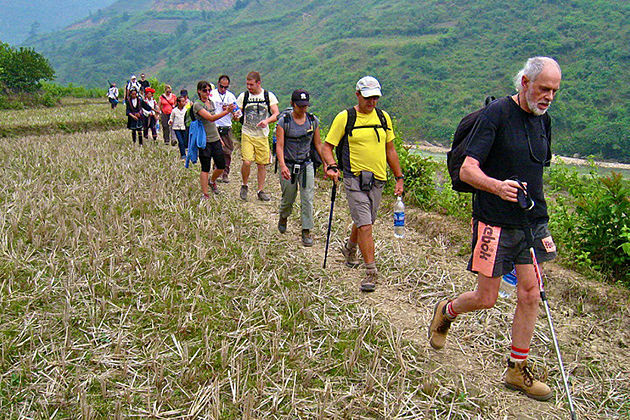 As defined by Wikipedia, trekking is “a form of walking, undertaken with the specific purpose of exploring and enjoying the scenery, which usually takes place on trails in areas of relatively unspoiled wilderness.” In other words, it is a category of adventure travel, typically involving visiting remote areas, with overnight lodging in tents or other minimal accommodation. Trekking in Sapa is remarked as not too difficult; however, it still has some challenges like the rapid weather changes or several severe ups and downs on some points of the trails. As a result, always be cautious of the time it may take to reach the destination so that you can reconsider if it will suit your abilities or not. Typically, there are 3 levels that explorers can choose from easy trekking, moderate trekking and hard one. It is often viewed as harder than walking since trekking trail is not steep, which has some ups and downs on the way. However, easy trekking is the most favorite option due to its short period of time and safety for those who just want to experience a little bit about trekking. 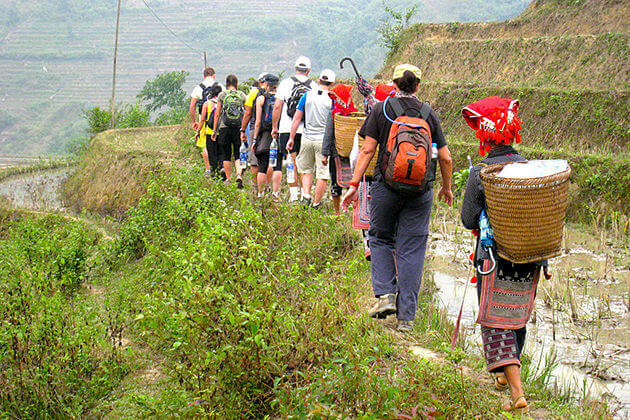 An easy trekking route will take you nearly two days, which can bring travelers a general knowledge about Sapa, its unique tribal residents as well as the unspoiled beauty. 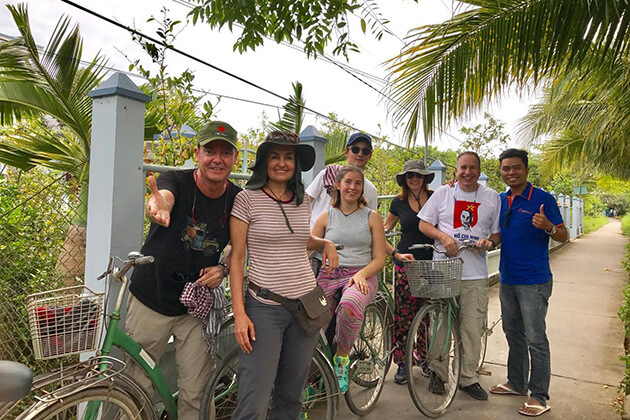 The next day, explorers can go uphill and pass through stunning terraced rice fields before getting to a bamboo forest and a waterfall. Besides, Giang Ta Chai (Red Dao people’s village) and Hau Thao Village can be seen on the way. The exceptional thing is that people can see lots of H’mong and Dao women gathering here for trading and exchanging handicrafts and make friends easily with them. 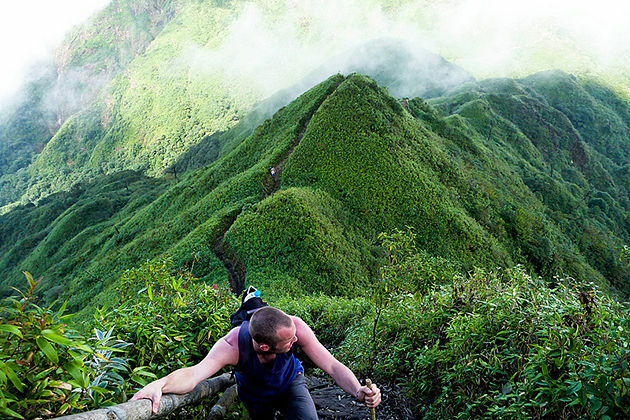 The moderate trekking trail in Sapa has ups and downs, but not so steep. It will become more challenging and difficult in poor weather conditions. The route for medium trekking in Sapa is fairly similar to the easy one but lasts longer since tourists will have a two-hour walk through Cat Cat Village before moving to Muong Hoa valley. It is near the bottom of the deep valley right at the foot of Fansipan Peak, which lets travelers take in the glorious and spectacular scenery. 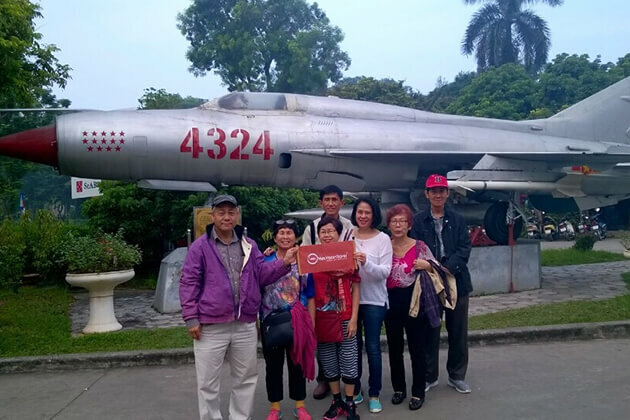 Besides, you can discover many fascinating facts about their ordinary life as well as culture and architecture. Hard trekking route has a steep incline and is often off-road in remote areas, very demanding and strenuous during periods of rain. 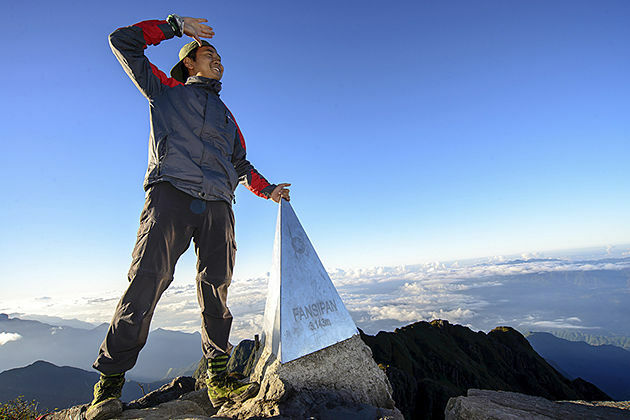 Conquering the top of Fansipan Peak, the Roof of Indochina, is the most challenging route for tourists, as they will need to spend three days completing the hike. 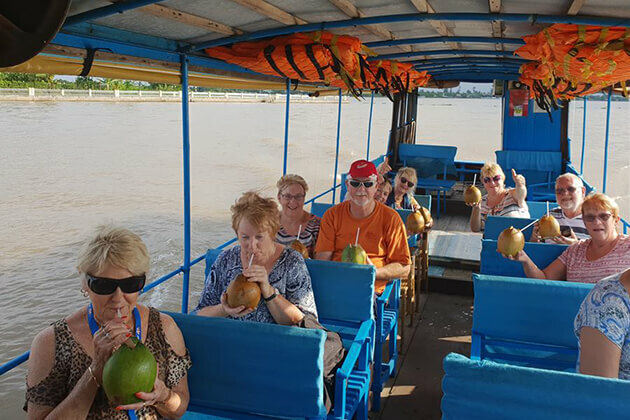 It is hard to trek on your own; therefore, you need a local experienced guide and porter who understand the route deeply to ensure the safety. 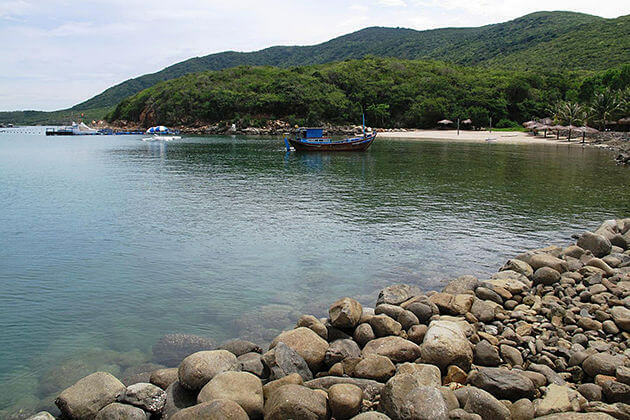 To reach the first campsite at an elevation of 2300m, tourists will follow the itinerary of passing Cat Cat Village, crossing Muong Hoa River and trekking upward for nearly 7 hours. The way from the first campsite will become steeper and make it difficult to hike as tourists trek through the Arrowroot plantations and bamboo forests, where people spend their night sleeping in bamboo hut or tent. The next day heading for to the second campsite at the altitude of 2900m, people can see giant old pine trees and more bamboo. The campsite is on the mountain slope facing west, near a mountain stream. The following day will be the summit day as travelers will climb to the peak of Mt. Fansipan, with the height of 3143m. 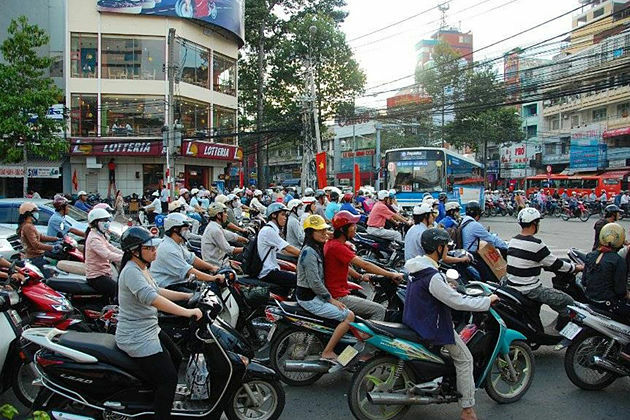 It is the most arduous but it is worthy as from the peak, tourists can see the best breath-taking panorama of Vietnam. The last day of the trip is spent on trekking downhill back to Sapa. What to Bring during Sapa Trekking? If you come up with a plan for trekking in Sapa, hope the recommendations below helpful for you. Explorers are highly recommended to hire a local guide to be your companion who is familiar with the local tracks, changes of weather, terrain, and the best lookout spots in the destination. 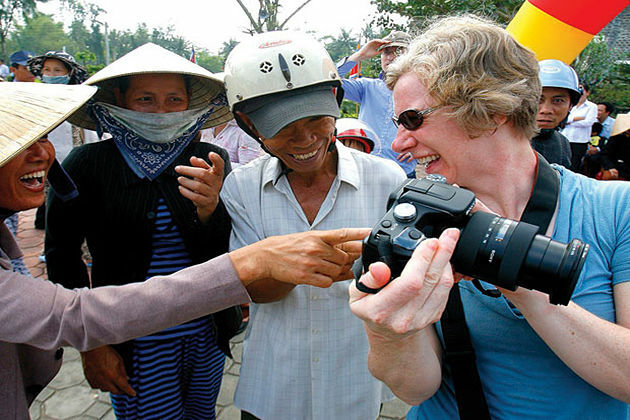 You can easily seek for a local guide since Sapa has quite a lot travel agencies or homestays that offer this service. 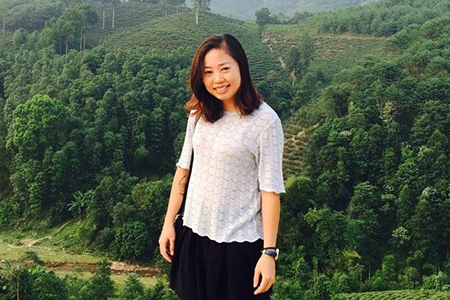 In addition, most of the local guides in Sapa are good at English, which is a strong point in communicating with foreign travelers. Remember that “trekking” means you would pass on tough roads or come across forests full of branches and even thorns. As a result, good footwear is definitely demanding. You are suggested to buy sturdy running shoes with good support and a solid grip. You are also recommended to consider hiking boots for the more-than-two-day trip. Besides, take a note that there is a great number of shops available in Sapa that both sell and rent trekking gear, which is much more convenient for explorers. Bring as much as possible the amount of water that you intend to bring. It is obvious that you will be very thirsty on a long trip walking through rough roads, even more like a camel guzzling for water in the desert. The lucky thing is that there actually are some stands selling water as you get closer to the town. Since this destination is full of homestays, it is no need for you to pack heavy with sleeping bags or heavy luggage of all daily stuff. Keep in mind that you should only bring what is absolutely necessary for you. The pack may not feel heavy when you first try it out of the door, but it can turn to be a big problem in the day progress.